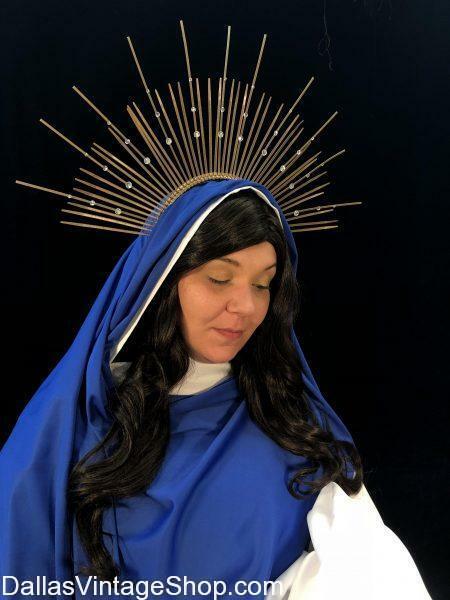 We have a variety of Biblical Character Costume Halos & Crowns for Bible Character Aura Crowns, Iconic Saints Halo Headdresses, Met Gala Heavenly Bodies Sunday Best Red Carpet Outfits and for Christmas & Easter Pageant Elaborate Costumes & Accessories. Dallas Vintage Shop has an assortment of Heavenly Bodies Met Gala Headdresses, Aura Halos, Crowns & Biblical Character Costume Halos in stock in our Dallas Area Costume Shop. These Headpiece Crowns are like the Renaissance Painting Auras around the heads of Saints, Historical Clergy and Biblical Characters. We have plenty of styles that resemble the Heavenly Bodies, Met Gala Catholic Church Historical Liturgical Attire worn on the Red Carpet for the 2018 Met Gala Sunday Best Celebrity Gala Outfits. These Met Gala Crown Headpieces can be worn as the Virgin Mary Halo, Bible Character Auras, Historical Saints & Clergy Crown Headdresses. You will find Complete Costumes, Wardrobes or just the Accessories you need for any Historical Church Fathers, Catholic Saints or Bible Story Characters.